UNCASVILLE, CONN. – May 31, 2018 – A historic Super Saturday is heading to Barrett-Jackson’s 3rd Annual Northeast Auction as the World’s Greatest Collector Car Auctions® has teamed up with Shell and Pennzoil to host goldRush Rally during the final day of the auction, June 23, 2018, at Mohegan Sun in Connecticut. It will be the rally’s first stop during its 10-year anniversary event and the first time in goldRush’s history the rally has stopped at an auction during their epic drives. 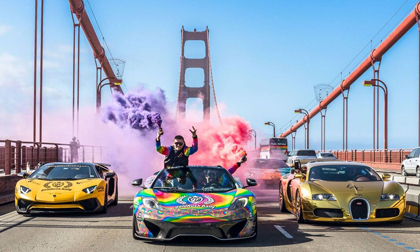 For the last decade, goldRush Rally has welcomed distinguished guests, VIP celebrities, and automotive influencers to the #1 luxury rally in the country. Participants drive through high-profile cities and scenic back roads with unforgettable moments witnessed by dedicated fans and paparazzi alike. Some of those moments have included shutting down famous landmarks along the way, including the Golden Gate Bridge and Las Vegas Boulevard. This momentous occasion will be nothing less than exceptional with a groundbreaking lineup of cars, people and places. The event kicks off in Boston on June 22 and will stop in 10 cities over 10 days – including Pittsburgh, Dallas and Barrett-Jackson’s hometown, Scottsdale – before finishing the rally in Las Vegas on July 1. During the stop in Connecticut on June 23rd – on its way to New York – the cars will be staged in the parking lot at Arooga’s Grille House & Sports Bar for fans to see while rally participants visit the auction inside Mohegan Sun.